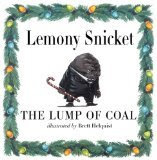 Lemony Snicket has struck gold again...this is THE most adorable story about a lump of coal I think one will ever read!!! One quote from the first page says it all: "Miracles are like pimples, because once you start looking for them you find more than you ever dreamed you'd see..." Love or hate The Series of Unfortunate Events, this is a must read holiday story! Where do you find the time to read all htese books?? I serously have to get up early to get the B of M in. It takes me weeks to get though books! You amaze me!